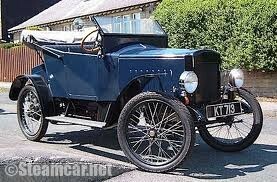 The Pearson-Cox was the last new make of steam car to appear in Britain, where nearly all steamers were imported. Percy Cox and Henry Pearson opened a garage in 1908, and the following year they announced their car. It had a 3-cylinder compound engine, semi-flash boiler and shaft drive. The bonnet contained the boiler, and a 2-seater body, it looked like a petrol car. The first model was 12hp, but later both 8 and 15hp models were advertised, the larger car with a 5-seater body. In 1910 with a capital of £2500 they formed a private company and even appointed a North of England distributor at Gateshead, but production was only on a made to order basis, and probably no more than 20 cars were made. In 1913 they built a petrol-engined cyclecar powered by an 8hp JAP engine, and with belt drive to a gearbox over the rear axle and from 1914 to 1917 they offered a steam-driven motorcycle.